The Vivo Nex 2 will be coming with dual display as mentioned before. The primary one will have a 6.4 inch Full HD+ full view super AMOLED panel with 1080x2340 resolution and 403 PPI pixel density. The aspect ratio here will be 19.5:9 with a small chin at the bottom. In the backside, there will be another super AMOLED 5.49 inch Full HD panel with 1080x1920 resolution as a secondary display. There will be a dedicated button to switch between the two displays. The users can choose between their preferable screen size. Though no any display protection has been confirmed till now by the brand. The performance with the Vivo Nex 2 will be quite similar to the predecessor as both of them contain same SoC, the Snapdragon 845 by Qualcomm. This is a much better chipset in the flagship level phones. It can give good graphics experience with Qualcomm's own, the Adreno 630 GPU. While there's nothing big chance in the hardware section, the software section will be more exciting as the Vivo Nex 2 will be coming with the latest Android version from Google, the Android 9.0 (Pie). But there will be a custom skin on the OS, the Funtouch version 4.5 on the main Android. The dual display of the Vivo Nex 2 has enabled the option for the manufacturers to remove the front camera here. That's why the Vivo Nex 2 will not have a notch, not a hole in the display or a pop up mechanism. The rear cameras will be used both as main camera and also the selfie camera. In fact, while shooting, the user can use both the displays for the perfect shot. The main camera here will be a 12 MP RGB sensor with f/1.8 aperture, 4 axis OIS and dual pixel technology. But the depth sensor has been downgraded relatively as it has a 2 MP sensor. There will be another Time-of-flight sensor working as a 3D sensor on the rear side. This will help the user to unlock the device with his/her face's 3D picture. Still the camera module doesn't seem to be much interesting as these days the smartphones are upgrading the camera numbers with 4/5/6 cameras. In fact, a patent by LG shows 16 camera lenses in the rear side (Check full article here) but Vivo, in spite of omitting the front camera, is still providing 3 cameras with minimum megapixel count. I'm not in favour of the bigger camera stats, but Vivo could add a better depth sensor and also a dedicated sensor for selfies at least. The Vivo Nex 2 has been launched recently in China with only 10 GB ram variant with 128 GB storage option. No other variants for ram or storage has been confirmed till now. 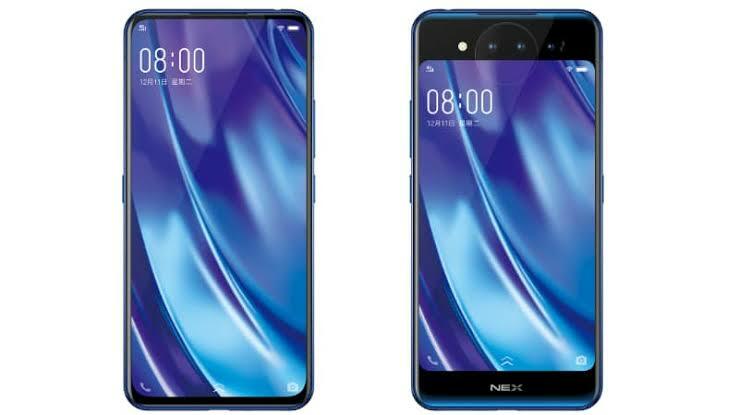 There are two colour options available for the Vivo Nex 2, the “Ice Field Blue” and “Star purple”. The pre booking price in China is set at CNY 4998/- that compares almost 52,000/- Indian rupee. The smartphone will be delivered after 29th December, 2018 in China. The Vivo Nex was priced at near 45,000/- INR in India. We have to look forward for the Indian pricing also but if it is just like the Chinese pricing, we must say the Nex 2 will be overpriced. 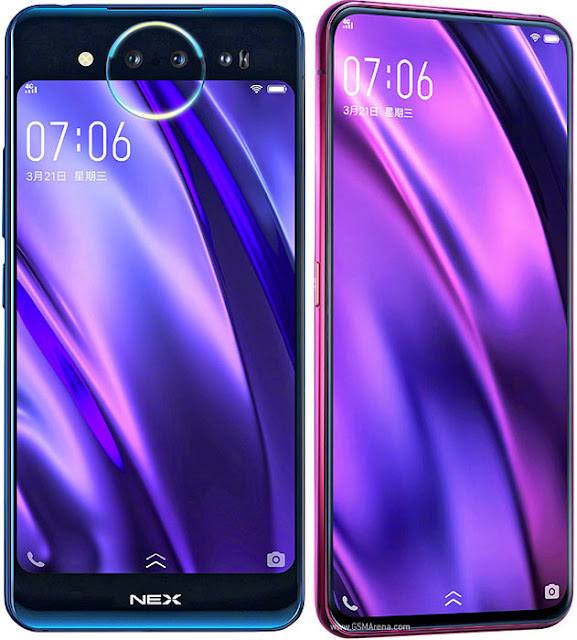 The Vivo Nex 2 does have the dual display but the other specs doesn't justify the extra money demanded by the brand. It must be under 50k or lesser in India. The battery section of the successor has been downgraded. As we saw a big 4000 maH battery with the Vivo Nex, the Nex 2 will only have a 3500 maH battery for dual displays. And while using both the displays for camera purpose, the battery will be working harder to power both the displays. So the 3500 maH looks more smaller after that. All other specs and sensors will be available like Wi-Fi 802.11 a/b/g/n/ac, dual-band, Wi-Fi Direct, hotspot, Bluetooth 5.0 and the A-GPS, Fingerprint (under display), accelerometer, gyro, proximity, compass etc. The USB type c port will be available with 22.5W fast charging support also with the 3.5mm audio jack. Basically, the Nex 2 has come up with a new concept to provide the full screen display without the pop up mechanism. This was the main reason behind criticising the Vivo Nex to the experts as the mobile devices with moving parts can never have an IP rating. And being a $700 phone, this was a big con of the device. This time Vivo has done the perfect job but still the Vivo Nex 2 doesn't have any IP rating. The predecessor had dedicated 8 MP sensor for selfies. But this one only have the main sensor for selfies. Vivo was known for its selfie cameras, but this time they didn't provide a dedicated selfie camera. Also the battery was downgraded by 500 maH though having harder work to do. These can be counted as the cons for Vivo's next all screen display smartphone.